Photo: The Quadro 4D, shown above, will open a new can of worms for every state if it is approved for sale in the US in 2011. Along with all the variables in configuration, licensing requirements for trikes and variants may not necessarily "line up" with the available technology. In the Pacific Northwest, the three states of Washington, Oregon and Idaho have training and licensing requirements that can vary widely. The State of Washington has three endorsement types with separate training for two- and three-wheeled motorcycles and their variants. License endorsement include 'Class 3' for a standard two-wheeled motorcycles, 'Class 5' to operate motorized tricycles, (but not a two-wheeled motorcycle) and 'Class 7,' for those who have successfully completed the rider tests for both standard motorcycles and trikes, allowing an operator to legally ride both two- and three-wheeled motorcycles. In the state of Oregon, state-sponsored training classes are available for two-wheeled motorcycles only. Taking a rider training class for two-wheeled motorcycles gives you an endorsement to ride a motorcycle of any type, including trikes and motorcycles with sidecars, but if a rider bypasses the TEAM OREGON training class and takes the Oregon DMV skills test on a trike, the test is different from that of standard motorcycles, and will result in a trike-only endorsement on their driver's license. Photo: Proficient Motorcycling author David Hough, seen here above Klickitat Canyon, wrote the original Sidecar/Trike training curriculum now used in Washington State. He's been riding a Can Am Spyder (reverse-trike format) since 2009. Due to the bike's handling characteristics, TEAM OREGON currently makes an exception for the MP3, and allows MP3 riders into the two-wheeled training course, but is reconsidering this policy due to recent changes at the Oregon DVM that no longer grant an unrestricted two-wheeled endorsement to MP3 riders, giving them a three-wheel restriction instead. According to Steve Garets of the Team Oregon Motorcycle Safety Program, "Regarding ...the student who takes a class aboard an MP3 and what type of completion certificate they receive, that's now under review. We'll have an answer before training begins anew in 2011. We can either grant them an unrestricted completion card, allowing them to qualify for a full unrestricted endorsement, or a restricted completion card which only provides a 3 wheeler endorsement. Another option is to remove the MP3 exception currently in practice, meaning that we would not accept any three-wheeled motorcycles in [the two-wheeled] training [class]. We need to align with DMV on this matter." In regard to "standard" trike-specific training, Steve says, "In our mandatory training provision, we are excluding trikes of all types. We aren't qualified to teach trikes, don't have any in our fleet (and aren't getting any), and it's impossible to justify a statewide program for 10 or fewer customers [a] year. The handling is so different that it's not practical to include them in the same motorcycle class. That's why we need different classifications." Idaho's STAR (Skills Training Advantage for Riders) motorcycle training program grants an endorsement with the successful completion of the course, and passing the Idaho Transportation Department (IDT) two-wheeled motorcycle test also allows the operator to ride both a standard motorcycle or a trike of any kind (including a motorcycle with a sidecar). Idaho does offer a sidecar/trike training program, but like Oregon, if you test on a trike, your endorsement will be restricted to a trike, and a "Three-Wheel Only Restriction" is placed on your driver's license. But Idaho also makes an exception in the testing process for three-wheeled variants that handle more like a standard motorcycle than a trike. From Debra Hall, Drivers License Program Specialist for the Idaho Transportation Department (ITD), "We treat the Piaggio MP3 the same as a two-wheel motorcycle during the test, scoring all tires. Idaho uses the Alternate MOST [Motorcycles Skills Test] for skills testing. Applicants testing on an MP3 do not have a three-wheel restriction put on their driver's license." In Washington state, the process of training and testing for a bike like the Piaggio takes a slightly different tack. According to Bruce Thomas, Motorcycle Safety Program Manager at the Washington State Department of Licensing (DOL), "Training for 3-wheeled motorcycles includes Trikes [and motorcycles with] Sidecars along with their variants. The training meets the handling characteristics of each of these types without difficulty. The Piaggio MP3 has three wheels in contact with the ground, thus requires a 3-wheeled endorsement, but we place the rider of the MP3 into 2-wheeled training because of its handling characteristics. The current curriculum for 2-wheeled motorcycles applies to the MP3 and the MP3 is actually tested at the same criteria of a standard 2-wheeled motorcycle." 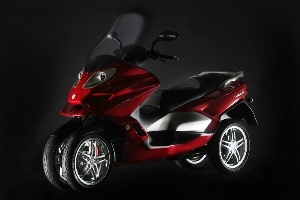 Photo: Piaggio's MP3 has three wheels but handles more like a two-wheel motorcycle than a trike. Washington State law says that if the vehicle has three wheels in contact with the ground, it requires a Class 5 or 7 endorsement (the law is not based on handling characteristics). However, because it handles like a 2-wheeled motorcycle, the rider of an MP3 is placed in a 2-wheeled training class and is tested on the 2-wheeled requirements for knowledge and skill. The catch here is that if stopped by law enforcement, the rider of an MP3 must have some type of three-wheeled endorsement. As the rider has passed the two-wheeled training class and rides a three-wheeled motorcycle, the DOL opts to give an MP3 rider a Class 7 endorsement. So the rider of an MP3 takes the 2-wheeled motorcycle safety class, and providing they pass the course, gets a two-wheeled class completion card that waives further testing, and is issued a Class 7 endorsement, and even though the rider may not have had formal instruction on operating a standard trike or motorcycle with sidecar, they are licensed to do so. It can get pretty confusing. In many states, including Washington and Idaho, currently an MP3 owner can take a 2-wheel class and receive a 3-wheel class endorsement which certifies they can operate both a two wheel and three wheel vehicle. What if the MP3 owner, who has no formal sidecar instruction, takes out his friend's Ural sidecar rig and proceeds to cause serious injury or worse to himself. Who is liable for that happening? "... The trike handles like a tricycle on steroids. [It's] very stable but if you push it in a corner you can feel the front end flex and tire complain... The Spyder handles like a car with handlebars. The MP3 is motorcyclish with a heavy front end. The skills are different between the motorcycle-style vehicles vs. the trikes." "...Variants have been draining into the motorcycle classification, but most don't handle anything like a motorcycle. Many new vehicles on the market are capitalizing on the absence of federal motor vehicle safety standards (FMVSS) for motorcycles and calling their vehicles "motorcycles" when in fact there is no performance [or] handling resemblance. We are considering the merit of multiple layers of classifications to take into account the variety of vehicle types you reference here." But his is by no means the only viewpoint. Stacey "Ax" Axmaker of the Idaho STAR program has a different opinion, both in trike handling, and whether more levels of training and licensing are necessary. He says, "In my experience riding trikes and sidecars, none of them handle like a car. The 3- and 4-wheeled vehicles that lean and have independent suspension for each wheel handle very much like motorcycles. A sidecar handles similar to a trike with a few differences resulting from the fact that the vehicle is not bilaterally symmetrical (and therefore left and right turns are different). So, I wouldn't say that the sidecar requires a 'completely' different set of skills, but it does require some additional skills when compared to a trike." "Yes, just as it makes sense that a single Class D driver's license covers cars, pickups, motor homes, vehicles pulling small (or even large) trailers, automatics, stick shifts, electric cars, sports cars, SUVs, etc. I don't necessarily believe that more classes of licensing will result in a net benefit. It might, but I remain to be convinced. What I believe would make a positive difference is for our driving culture to shift toward individual responsibility." Taking it a step (or a wheel) further brings us back to the Quadro 4D. As state regulations typically follow the lead of the National Highway Transportation Safety Administration (NHTSA) Washington, Oregon and Idaho all currently classify motorcycles as having a maximum of three wheels, and therefore any four-wheeled motorcycle could not be registered as street-legal at this time. Again, according to Debra Hall of the the ITD, "Our motorcycle definition basically mirrors federal definition for motorcycles, (not more than 3 wheels). [The] 4-wheeled vehicles described... would not be able to certify to meet either federal motor vehicle safety standards for motorcycle or passenger vehicles... until NHTSA addresses federal safety standards. When we are notified that any new type of vehicle meets NHTSA standards for motorcycles, we then follow with legislation of our own if needed. Upon acceptance by NHTSA, I meet with our Idaho STAR representatives and formulate how we will handle skills testing and training for new hybrid motorcycles, such as the Spyder and Piaggio." Steve Garets also sees the same issue. "Do I anticipate problems being able to register the Quadro 4D? Yes. It's not a motorcycle, by Oregon's definition, because it has more than three wheels." Photo: How's it work in your state? 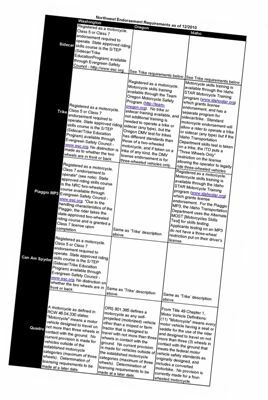 CLICK HERE to access our handy grid. Generally speaking, two-wheeled motorcycle training and licensing is an established process, and regardless of the type of motorcycle, the physics of operating a vehicle with two wheels on a single axis are similar enough that the information learned in a training course transfers to all makes and models, even taking into account the significant difference in handling between a cruiser and a sportbike. Complications enter the picture when you add wheels; where you add them, the wheelbase, and how it affects handling and the riding skills needed, as well as vehicle classification by federal and state agencies. Requirements for training and licensing for three- (and maybe eventually four-) wheeled motorcycles of all types even now vary enough from state to state to warrant recommending a clear understanding of the specifics of training, licensing and registration requirements for those thinking of purchasing a trike or trike variant, or owners moving to a new state. While motorcycles like the Piaggio represent a small percentage of the motorcycles manufactured, the evolving variations in the number of wheels, their spacing, and handling characteristics for bikes of this type will likely continue to fuel debate on training and licensing procedures for some time. As most states take their lead from the US Department of Transportation and NHTSA as to vehicle safety and roadworthiness, one logical option might be to have these two federal organizations determine how to qualify and classify each model, allowing the individual states to then incorporate those determinations into their own state law. Photo: The Ace Cycle Car uses a reverse-trike format. Oddly enough this one was spotted in Washington with a Washington State automobile plate on it despite the fact it's a 3-wheel vehicle. Note the driver sans helmet. In the case of the Quadro 4D, the manufacturer's promotional video shows that even though it has four wheels,it handles more like a motorcycle than many other motorcycle variants, so, providing that NHTSA gives the go ahead for its operation on US streets, rider training for a Quadro 4D would logically use programs for standard motorcycles. While I have found that there are as many opinions as there are experts to ask, there does seem to be a "common sense" component to having a training and license process that applies as closely as possible to the vehicle you ride. Phil Buonpastore is a free lance writer from Georgia who recently relocated to the Northwest. His work has appeared in Rider, MCN, Motorcycle Cruiser and other national print publications. In 2011, Bow Tie press will release his new book, Shifting Gears at 50: Motorcycling for the Over-Forty set. Welcome to the Northwest Phil!